It was announced today that manager Kenta Hasegawa has had his contract with the club extended to cover the 2010 season. After taking over in 2005, Kenta has guided us to three top five finishes in a row, and we're looking poised for a serious assault on the championship as this season searches it's climax. Shimizu born, former player Kenta has managed a total of 218 competitive games with us, winning 101, drawing 53 and losing 64. It's great to have this cleared up, so the man himself can get on with the job in hand - sending us into the ACL next year, hopefully with a first J. League title under our belts! Our third win in a row took us to within a point of Kashima who lost again, this time crushed at home 4-1 by Nagoya. Just five games ago the gap was looking insurmountable, but thanks to an incredible collapse by the defending champions, and a twelve game unbeaten streak by ourselves, the final seven games of the season is shaping up to be quite interesting after all! Vissel, who are not in bad form, were not an easy team to play against, but then they never are. Our last seven meetings before Sunday had all been won by the odd goal, with six of those ending 1-0. With that in mind, I don't think anyone was expecting a goal-fest, and they certainly weren't disappointed. We finally broke through a solid defence in the 82nd minute. Ichikawa thought fast to hit it through a forest of legs as a corner was partially cleared his way. Johnsen had gone close before, and Arata should have put it away from an earlier corner, but Vissel were no slouches going forward, and Kaito was forced to pull off an excellent save at the bottom corner early on. Ten minutes into the second half the visitors were a man down after their number 6 saw red after a second yellow. I'm yet to see a replay, but some J. League fans on this English language message board were bemoaning the fact the ref got played by an over-theatrical reaction from our player - ie: he dived. I hope not, but as I say, I'm yet to see it properly. Ten men can be notoriously hard to play against (just ask Tokyo) and so it was as we laboured our way towards a third straight 1-0 win. It was a game of few clear cut chances, and I was wondering if a point wouldn't be all that bad when we finally broke the deadlock. We're going to have be better against Hiroshima on Saturday if we want to move up to first, but I don't doubt we're capable. Looooco! Loco loco loco loco! We're well placed for an assault on the title, but it's worth remembering that Kashima still have to finish their game with Kawasaki, and while being 3-1 down, who knows what may happen in the last 16 minutes. Regardless of the outcome, Kashima will still be in the driving seat and it will still be in their hands. There are seven games remaining - 21 points - and a lot can happen in seven games. Just ask Urawa: July 18th - August 29th: Played 7, Lost 7. Goals against 15, goals for 4. So yeah, noone's getting too excited just yet, but for the first time in years we've got a real shot at the championship, and we want it. We want it bad. We're good enough, but we need to keep our eyes on the prize, not get carried away, and takes maximum points against Oita, Reysol and at least three more of our other remaining games if we're to end top. Do we believe we can do it? Course we do! Official pictures can be found here (top row). Click here for The Rising Sun's reports on the weekend's action. Tuesday evening edit: I've since seen the red card incident (available on this video, around 2:50), and while a trailing arm anywhere near a face is always going to have a ref reaching for his pocket, I can't help but cringe at what seems like Ota making a huge meal out of it. Kosuke is an excellent player, and has had a cracking season so far. I'm made up with him as a signing and as a regular starting member, but that was disappointing to see. I'd hate for us to become known as a diving team. We want to win, but let's win right. 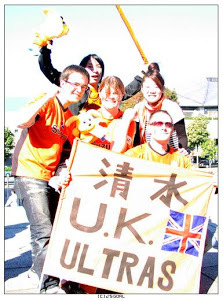 That's what makes us stand out above the Jubilo style of win-and-win-dirty in the late nineties. Come on boys, no more silliness, please! 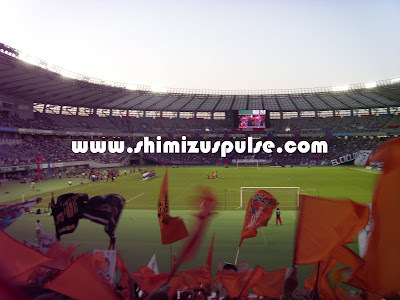 S-Pulse will face Sagawa Printing SC in the 2nd round of the 2009 Emperor's Cup, to be played on my birthday, Sunday October 11th. Kick off is 1pm. Sagawa progressed to the 2nd round after beating Biwako Seikei Sports Univ 1-0 earlier today. 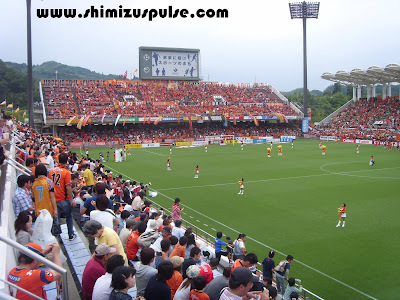 Sagawa Printing are based in Muko, Kyoto and currently play in the JFL, just below J2. For details of tickets, see here (Japanese). As is common with Emperor's Cup games, prices are slashed across the board. Not interested in the early rounds of the Emperor's Cup? 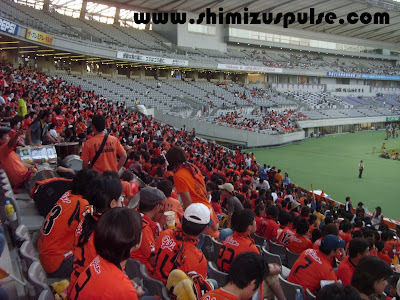 Well just bear in mind this game against Tochigi SC back in 2006. An incredible ten goals were scored in the final 31 minutes of play, so why not go along in October? You never know what crazy fun the cup will throw up! 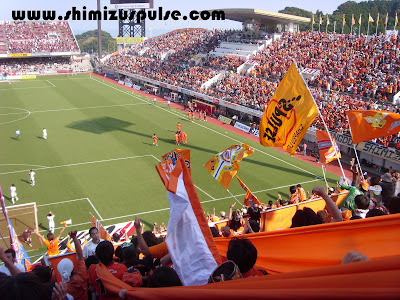 Our rich vein of form continued against Yamagata with a 1-0 victory up in the mountains. Now unbeaten in eleven, winning seven and drawing four, we climbed up to 2nd, just four points behind the severely faltering Antlers. There are eight games remaining, and as the title race starts to hot up, for the first time in years, we're right up there with a shot. Our goal came from Johnsen after a pinpoint cross from Hyodo was met by The Big Norwegian. He was able to beat the defender and powered an excellent header into the back of the net which left the keeper no chance. This made up for an achingly close miss by Edamura twenty minutes earlier after an excellently penetrating run down the wing by a resurgent Ichikawa. That itself came not long after Iwashita very nearly added to his four goal tally this season, and it needed an excellent save from the Montedio keeper to deny him. 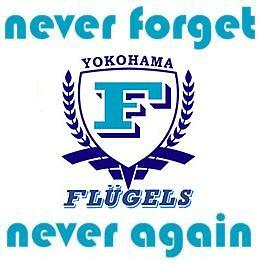 Yamagata caught us out on more than one occasion and it was far from a walk in the park. The home team have now lost their last four, and are in severe danger of the drop back to J2. Personally I hope they stay up, but they will have to be more decisive in front of goal if they're to manage it. At least twice they should have made more of their chances, and I couldn't help but think against a better team we'd have been punished. In terms of statistics it was a pretty one-sided match, with 14-3 and 8-3 reflecting shots and corners both heavily in our favour. We face Kobe at home next week, and we'll have to be rather more deadly in front of goal if we want to close the gap on the defending champions further. After that we host Hiroshima, which is shaping up to be a huge game. Our final three games are against pretty tough opposition, so I'm hoping we can take some serious pointage over the next five weeks. In the big picture this weekend, it was two big surprise results which let us gain ground on the top spot, with both Kashima and Frontale losing in games you would have put money on them winning. Gamba Osaka and Niigata both drew, and on Sunday Hiroshima could only draw with relegation threatened Kashiwa, so we end the weekend two points clear of 3rd with a better goal difference. In all this chat, let's not forget that Kawasaki have the remaining 16 minutes of their rained off game with Kashima still to play. 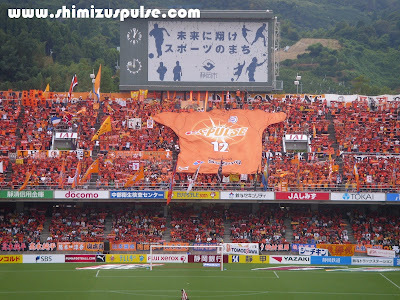 If they can hold onto their 3-1 lead, Kashima's goal difference will be cut by two, and join S-Pulse on plus 13. The title race is well and truly on! Having just read my own post back, I can't help but notice how measured and calm it all seems. Nothing could be further from the truth - I think the prospect of having a pop at the title is just playing havoc with my nerves! COME ON BOYS - NOW FOR THE FINAL PUSH TOWARDS GLORY! Full highlights. The yak ends and the action starts at 0:48. For official club photos, click here (top row). The Rising Sun's review of this, and all other J. League games this weekend, can be found here. 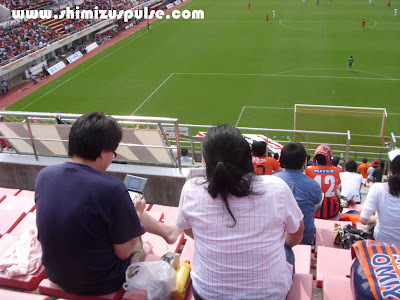 Feeling slightly burnt out from 22 games so far this season, I took Saturday's low key match with Omiya as an opportunity to leave the East Stand madness behind for 90 minutes and watch in the sedate confines of the West Stand. As one of the lowest gates of the season settled in for an OK game of football, I spread out in the yawning swathes of empty seats within spitting distance of the away fans. Not that there was any naughty behaviour of course, although one disgruntled visitor lashed out at the segregating fence as he stormed home at the final whistle. His frustration was one keenly felt by the hardy bunch of other orange fans, as with time running down, we contrived to waste time right in front of them in the most blatant of fashions. I'm far from a fan of the take-it-to-the-corner-flag-and-keep-it-there-for-as-long-as-possible technique, but seriously, the way we had all three points snatched from us against both Kyoto and Kawasaki, I know why they do it. We'd taken the lead with a rising drive from The Big Norwegian after just four minutes. Okazaki had headed down a long ball into his path and he made no mistake. After a couple of scares as Omiya caught us on the counter, real clear cut chances were pretty few and far between for either team. 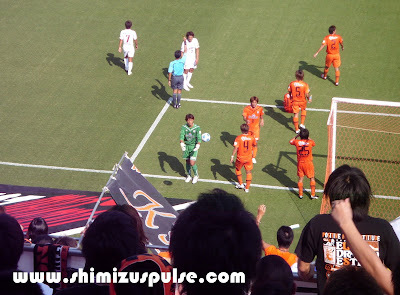 We managed more than double the number of shots than Omiya and enjoyed greater possession, though. It's always a very fine line between success and failure, and Johnsen's 8th goal of the year was the difference today. Some heartening news was Nagai's late appearance. After his early substitution against Tokyo last week I feared he was destined to never make it with us, but he looked OK for the short time he was on, and went close at the end to grabbing a second for us. Okazaki started, but after his week away with the national team in Holland, he was not surprisingly a tired man. He was replaced with Fujimoto not long into the 2nd half. So with all three points we're unbeaten in ten and maintain our fourth place, joint with Hiroshima on points and goal difference, but having won less. The others in the chasing pack for the ACL spots (Hiroshima, Osaka and Niigata) also all won today. Full time and three points for the home team - us! Next up is Yamagata away, a game I am sorely tempted to attend, purely because it's such a mission to get to. Having thought it over long and hard, the price tag of nearly 40000 yen is putting me off, and I also have work I should be doing this Saturday, so I'll be watching on the box. We did them 4-1 in the home game, and they lost by the same margin this weekend, so fingers crossed we have what it takes to beat them away from home and keep our strong run going. Right, suggestions for fun ways to spend Culture Day please? It suddenly became freed up. It was a bit of disaster all round for our boys. Nagai limped off before the first half was even up and Aoyama went off injured on 56 minutes. Despite that, and the lack of Iwashita and Okazaki which had an obvious impact, for spells we looked OK. However, the fact we had nearly double the corners but only half the shots of the home team tells the story. There was a lot of forward movement and nice passing play which carved routes through the Tokyo midfield, but the end product just wasn't there. The one or two clear cut shots we had ended up in the stands or in the safe hands of Gonda. No Hara on ｔhe bench (he's still out for another week or so) meant we were reduced to throwing Nagasawa on for the last 20 minutes. No disrespect to him, but when he's your final roll of the dice to get goals, you pretty much know it's a lost cause. So in isolation, and given the absence of Okazaki, Iwashita, Hara, and Nagai and Aoyama's enforced substitutions, not a horrendous performance. But of course, this was a cup semi-final second leg which we had to win. 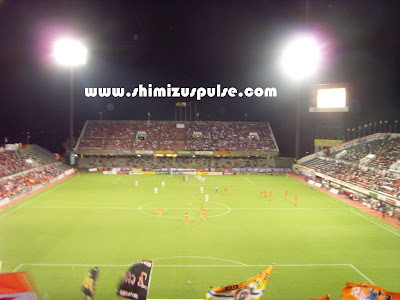 We didn't, and wouldn't have if we'd played till midnight, so that's that for 2009's Nabisco Cup run. Reports from The Rising Sun can be read here. Official pictures can be found here (top row). I'll start by saying how proud I am of the boys to come back from what seemed an impossible situation. We salvaged a draw with ten men, and while two away goals against is hardly ideal, it means any victory would be enough on Sunday. A decent crowd turned out, including a very good away following. It was roller-coaster of a game, and both sets of fans would have left with mixed emotions. Personally I was ruing the lack of a home win, but playing the second half a man down we were chasing shadows for minutes at a time as Tokyo stroked the ball around. They went close a number of times, and a third goal would have surely finished this tie off, so I was ecstatic that we could claw ourselves level through Edamura on 69. We'd gone behind to a long range daisy cutter from Yonemoto. Kaito had his line of sight blocked by some legs which on most days would have got in the ball's way, but not today. It was struck with venom, perfectly directed to the bottom corner, and left Kaito no chance. Straight away Johnsen equalised with a lucky rebound on his header from a corner, but less than ten minutes later, a windy run by Cabore saw our defenders helpless to get a challenge in, and he put it away to give Tokyo the lead. So it was at half time, but come the second half, come renewed hope. It didn't last long. Within a minute of the restart, Iwashita was sent off. A straight red came after... I'm really not sure what. Have a look at the highlights below (which incredibly don't show a replay of the red card offence) and it's hard to see what happened. I'm going to reserve comment until I've had a good view of it. 2-1 down, a man sent off, and 45 minutes still to play? Yeah, for a moment or two the ranks behind the goal were dumbstruck and possibly wondering how many we were going to lose by. But that kind of thinking has no place at Nihondaira, and after we'd had a minute to dust ourselves down, there was a real sense of purpose and belief as we shouted and sang that bit louder. Yeah, we lived dangerously on more than one occasion, but we had no choice but to go for broke. The breakthrough came when Edamura latched onto a loose ball after a nice move down the right. His shot, which was surely heading for Gonda's hands, (who had a very solid game) was deflected over him and into the net. We went wild, but still spent the last 20 minutes fearing every counter attack. We even managed to pull a couple of saves out of Gonda, but time ran down and we felt very happy with the draw. Yep, two away goals conceded ain't great, but given everything, we'll take it. Roll on Sunday and may the best team win! 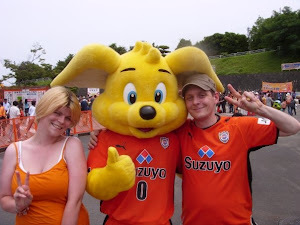 I can't sign off without a big shout out to Dokool, creator of the FC Tokyo blog Aishiteru Tokyo. It was great to put a face to name, and I'm glad to hear you had a good day and enjoyed Nihondaira (and our cheerleaders!). 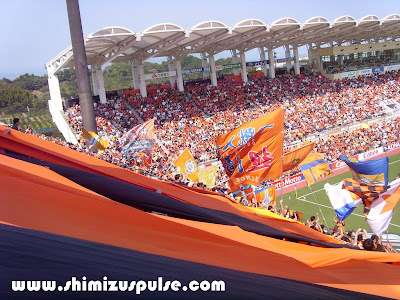 Let me know if you're going to head down Shizuoka way for the league game in October. I can't embed these, but here are full highlights. Here are some embedded highlights, although the order is a but messed up with Johnsen's goal not coming till the end for some reason. 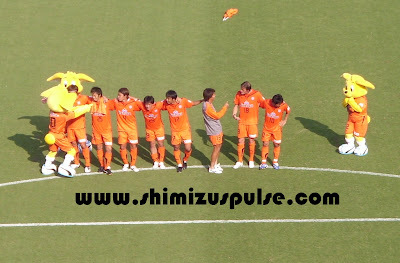 Official match pictures from the S-Pulse homepage can be found here.